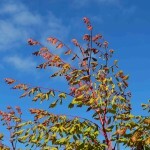 A small tree with leaves that are a bright coral-red when they emerge in the spring. They mature to medium green in the summer, with coral colored petioles. 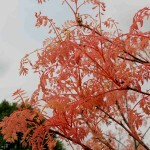 The fall color is coral-red, orange and yellow. The summer blooms are bright yellow, followed by papery seed capsules. It is generally adaptable to tough, urban environments. A site with well-drained soil is important.